AFC - 12/22/05 Is it a Merry Christmas to Them, too? Holiday season is the time when everybody talks about love, compassion and peace, but what happens behind sparkly decorations and fake or cut-down Christmas trees is totally the opposite: the greatest massacre of animals and very little or no care for other people. We want to encourage individuals and institutions to mark the oncoming holidays in the spirit of giving presents and giving thought about those who are now spending the last days of their lives and about the ones who are now sad and lonely. 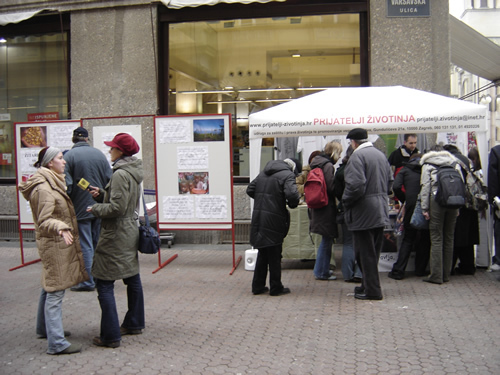 On Thursday, December 22, 2005, on the corner of Varsavska ulica and Petar Preradovic Square, Animal Friends will set an info stall and an exhibition showing the relation between meat industry, world hunger and overexploit of natural resources. At 11:30 A.M. the activists will give away holiday delicacies (vegan cakes) and hot tea. After this action, activists and pop singer Minea will visit the Centar za radnu terapiju i rehabilitaciju "Sv. Vinko Paulski" (center for work therapy and rehabilitation) in Oborovo. The little patients wanted to meet the Croatian singer Minea who also is against wearing of real fur. During the visit, Animal Friends will give them presents donated by ethical companies which joined this action. Centar za radnu terapiju i rehabilitaciju "Sv. Vinko Paulski" in Oborovo is home to a hundred of abandoned children and children with special needs who spent their whole lives in that center, from the beginning of their illnesses until they die. Patients are from age of three and older. They have various degrees of mental retardation which developed as a result of meningitis or complications during pregnancy or birth. The Foundation Stumme Brüder Stiftung from Liechtenstein also took part in this action. For years this foundation connects animal rights organizations and children care centers, dorms and hospitals all over the world in order to show that fighting for animal rights includes fighting for human rights. In the name of that foundation activists will donate "Sv. Vinko Paulski" center with children beds, hospital bed, mattresses, position pillows, exercise mats, computer, various home appliances, digital thermometers, and other needful things. We want to use this opportunity to call citizens and institutions to help this center in any way possible. Animal Friends runs the action "Is it a Merry Christmas to Them, too?" to remind people about unfair global distribution of food. While on some parts of the planet arrogant people kill billions of animals and die of obesity, on the other parts people die of hunger. The consequences which come along with the meat industry are fatal for all of us. The meat industry is cutting down rainforests to making pastures for cattle. Deforestation results with extinction of many plant and animal species, locals are forced to move away and burning of trees boosts global warming. The meat industry ruthlessly spends natural resources. For example, factory farms spend more water than all other industries together and produce 130 times more waste than the entire population of the USA. Grain used as animal food in factory farms could feed hungry people. According to statistics 80% of agricultural land in the USA solely, is being used for breeding of poultry, pigs and other farm animals, and around 70% of all grain is fed to those animals. If all wheat, soy and corn which go to factory farms would be given to hungry people of the world, there would no longer be a world hunger.